Easter is this Sunday! Are you looking for super-easy Easter and spring decorating ideas you can create in just a few minutes? Then you are at the right place! Who has the time for elaborate decorations, right? 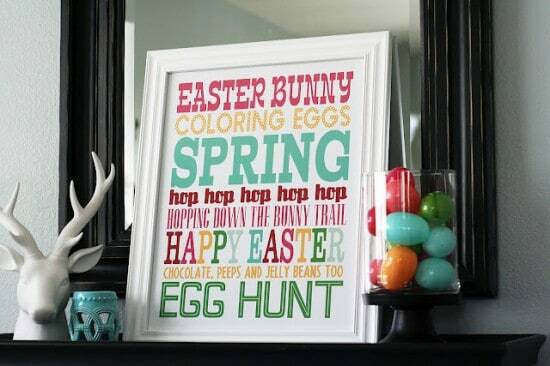 Here are 10 Easter and spring decor ideas that are so easy that you can make them even if you are DIY challenged! All of these ideas will only take a few minutes to make, I promise. Just download, print, and frame this free Easter art (8×11). It doesn’t get any easier. If you don’t have a frame, just attach it to your wall with washi tape that you can easily remove later. I would do this with cardboard paper instead of wood — that would be so much faster. Isn’t the “anyone home?” cute? Synthetic food dyes found in most American candy have been linked to cancer, hyperactivity, and allergies, so they don’t enter our house if I can help it. So if you don’t want to dye your Easter eggs with food colors, what can you do? You can dye them with natural colors, like beets. 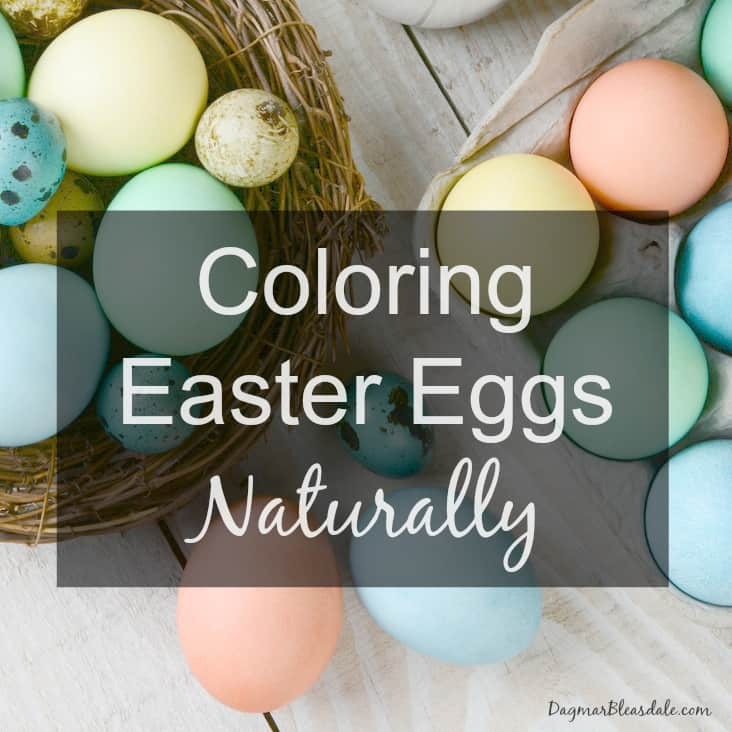 I wrote a whole post about coloring eggs with natural colors for Easter. These soft natural egg dyes are so beautiful, don’t you agree? Here is a tutorial I wrote about dying Easter eggs naturally. Along the lines of no food dyes, this is the only reason I would buy bunny Peeps – for a fun centerpiece. Seeing this, I’m glad I didn’t donate that square vase I have to our thrift store. Don’t put water into the vase with the Peeps — instead, fill a smaller vase with water for the flowers so the Peeps don’t dissolve. 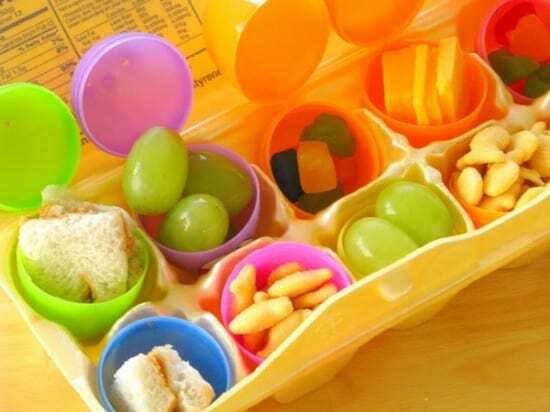 Have the kids hunt for their lunch, or surprise them with this whole egg carton full of eggs filled with healthy treats in plastic eggs! 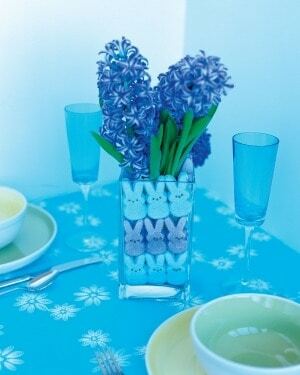 You can make these cute table decorations with the kids and fill the cups with organic/all-natural jelly beans. 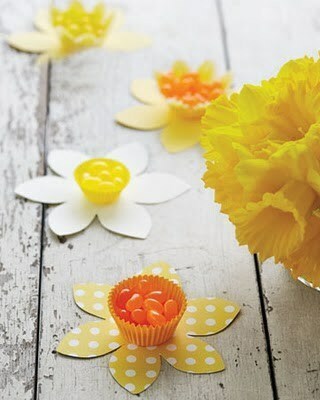 All you need is mini cupcake liners and yellow cardstock. Growing up in Germany, we would eat boiled eggs every Sundays, out of an egg cup. 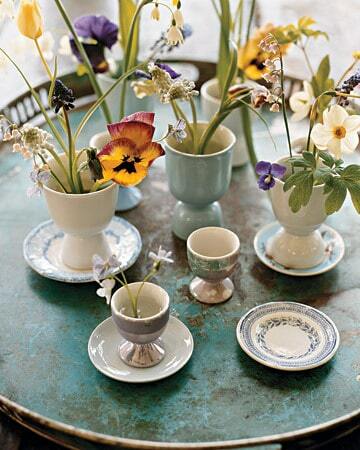 I’ve found that Americans don’t eat them like that very often, but maybe you still have some pretty egg cups around you could use for this sweet Easter/spring display. 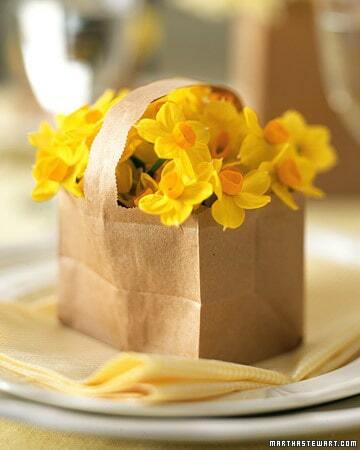 This brown paper bag basket is so easy to make, and the kids can decorate it with crayons or Easter stickers. 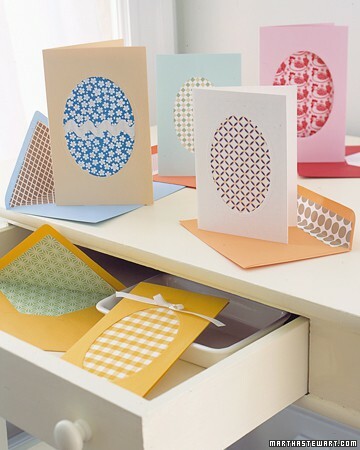 I have a whole book of scrapbook paper I didn’t know what to do with until I saw this idea for pretty Easter egg cards you can make with left-over paper (scrapbook, wrapping paper, wall paper, etc.) or even scraps of fabric. This is another great craft project you can do with your kids. 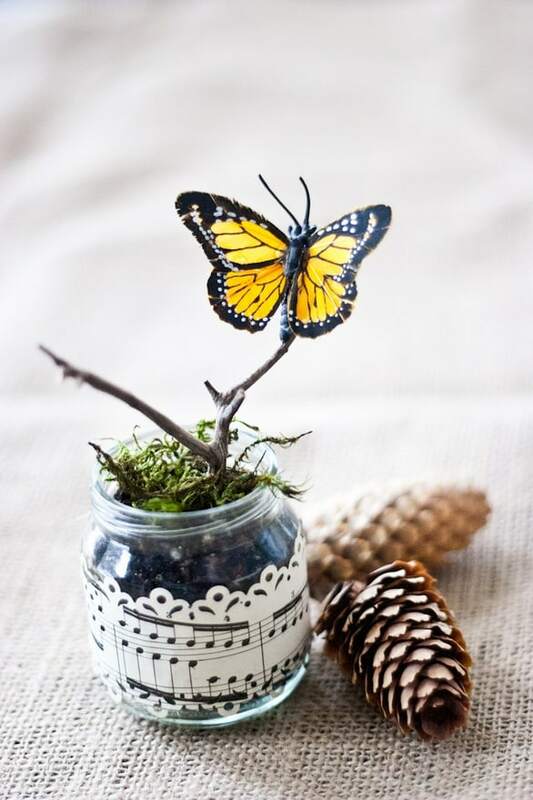 Just clean a baby food jar or any glass jar you would have otherwise thrown out, find a few twigs, and buy inexpensive fake butterflies on Amazon or at the craft store to make this spring decoration everyone will be talking about. Want even more ideas? 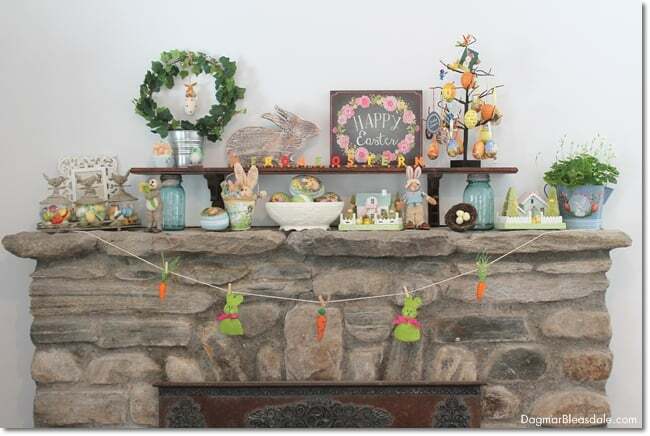 Here is a post about easy Easter table and mantel decor in our cottage. Pin this for later for inspiration! 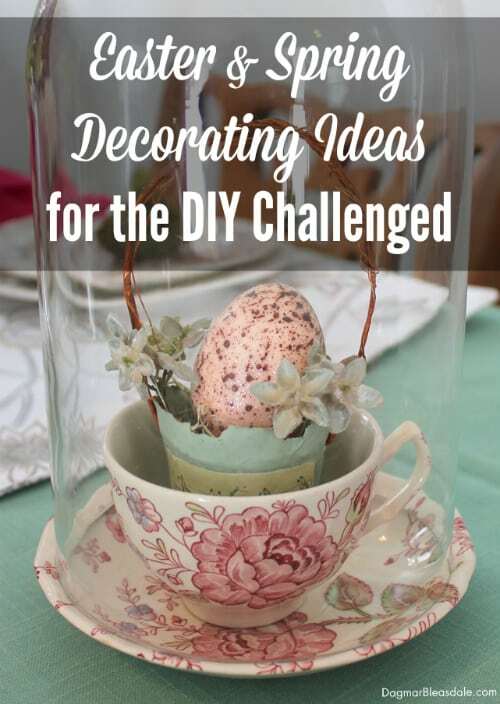 I hope you enjoyed these Easter and spring decorating ideas for the DIY challenged! 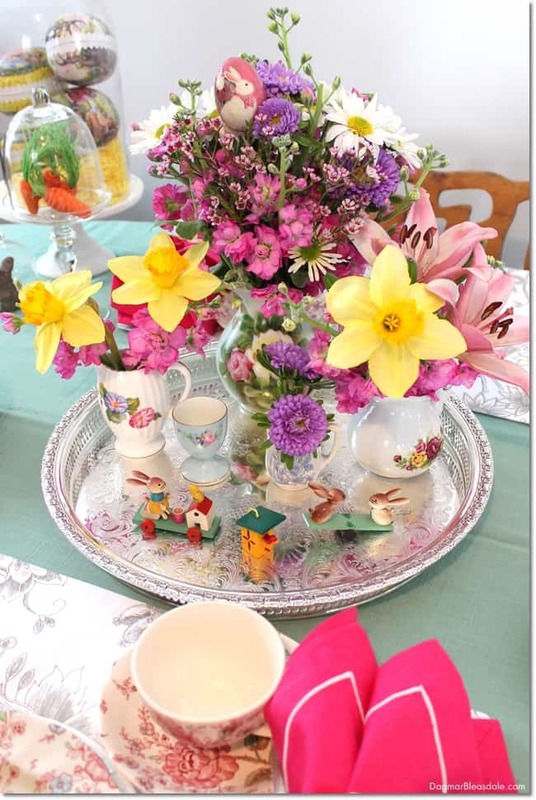 This is an awesome roundup but my favorite is the daffodils candy holders. What a cute easy idea. thank you for the inspiration. great roundup of ideas! I love the egg lunch idea! Thanks for linking up at Merry Monday Link party! You were reading my mind thank you! I have some much scrapbook paper just sitting around collecting dust now I have a plan for it. What a great round up of ideas!! I especially love that they are super easy, it’s not that I’m DIY challenged it’s just that with homeschooling 6 kids there just isn’t the time. I have been looking for a natural way to dye eggs this year, the less chemicals the better in my opinion. 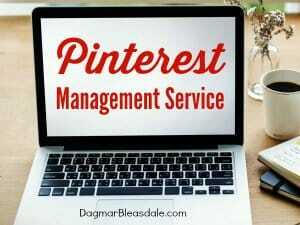 Pinning, stumbling, tweeting, and sharing on Google+. Thanks for lining up with Inspire Me Monday. Have a blessed week!! 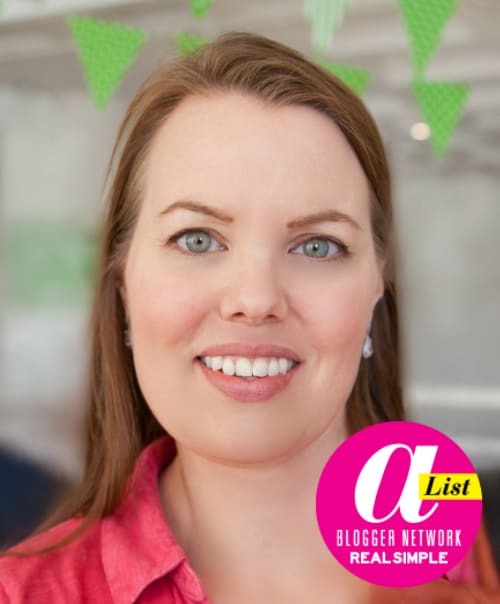 Hi Nicole, thank you so much for sharing this post all over – I so appreciate it! These are all so cute! Found you on the IFM hop! Love the clothespin craft! Thank you so much for attending week 16 of #PureBlogLove and linking your fantastic blog post, I can’t wait to see what you have in store for our next party, Thursday 8 PM EST- Sundays at midnight. Your post has been added to the #PureBlogLove Pinterest board for all to see :) Have a great day! 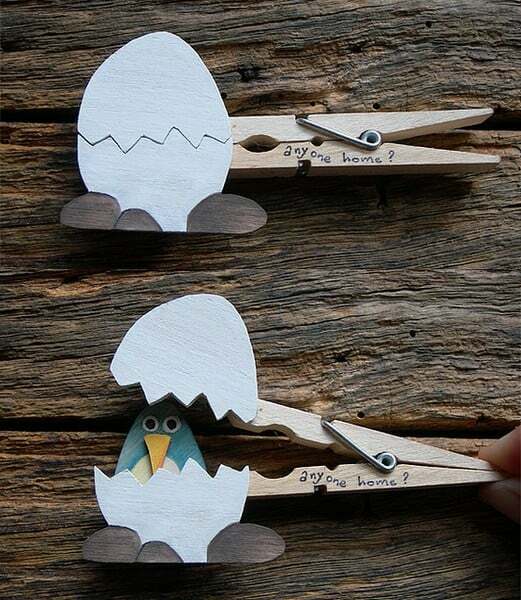 What cute little ideas! I’m loving these. I hope you’ve had a great weekend! Bautiful ideas. I am going to have to steal the Egg Lunch idea for my 3 year old. He would love it!